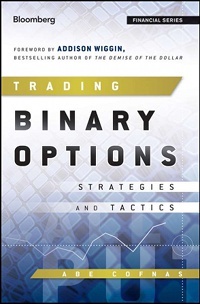 Trading Binary Options: Strategies and Tactics together with Binary Options by Hamish Raw are the only popular books dedicated to the topic of binary trading available on Amazon. I was not of great opinion about the other book and mentioned it my review. After reading this one, I must say, Raw’s book does not look so bad after all. Abe Cofnas is what I would call an average “Forex mentor”. He authored several books on trading, has worked a lot with the trading related journals, and currently offers paid courses, training and signal service. In my opinion, he has a perfect background for creating a book on binary options, especially in relation to currencies. Unfortunately, he takes the worst of his previous experience and puts it in this work. If you are new to the concept of financial trading, this book will get you confused. So you will have to start elsewhere if you are looking for a newbie-friendly guidance. That is not a con for a book, of course, it just needs to be mentioned. If you are new to the concept of binary options, you will have a great deal to learn from Cofnas’ work. It can be even worth buying in this case. Although I doubt it. If you are past your beginner’s stage in binaries, Trading Binary Options will still offer you something interesting, though not much at all. Firstly, you will learn what binary contract is, what types of them exist and what properties a binary contract has. Unfortunately, it will all be limited to what is offered on NADEX (North American Derivatives Exchange) only. Secondly, you will learn how to determine approximate probabilities of the market prices reaching various levels using the binary options. With that, you will also able to gauge the market sentiment simply by browsing the binary current contract prices. Thirdly, the book will teach you to do basic sentiment analysis using headline scanning and text mining. Then, Abe Cofnas will show you the most important fundamental analysis factors for some of the underlying markets. After that, the author goes into technical analysis and briefly covers quite a lot of topics from it — for example: candlestick patterns, basic technical indicators, volatility analysis, etc..
Then, it comes to various binary trading strategies, which are divided into five main categories: in-the-money, deep-in-the-money, at-the-money, out-of-the-money and deep-out-of-the-money. After discussing various entry and exit strategies, Abe turns our attention to a rather important topic of risk and money management, explaining the basic principles of position sizing and leverage. The penultimate chapter is a minor one and is dedicated to evolution of trader’s strategies. The last chapter of the book is a shallow introduction to the algorithmic (automated) trading in binary options. It does not share much information about it, but rather explains the advantages and disadvantages of the algorithmic approach. Some insights on how the binary options market makers work. Sentiment scanning ideas. They are not new, but they are presented quite well and can be used in many trading related applications, not only binaries. Presenting variety of ways to earn. Abe does not limit his trade examples to some narrow field or strategy type, and he motivates readers to seek opportunities that would surprise the markets. The book is quite short. You will not have to waste a lot of time on it. If that can be called an advantage. This is it. Not much to pay more than $40 for. The biggest disadvantage is that the book is, in fact, little less than an oversized advertisement for Abe’s websites, services and the NADEX brokerage. Author’s binary options website is pimped in almost every chapter. The next disadvantage is closely connected to the first one. Most of the links to the author’s website could be useful if only they worked! But they do not, pointing at non-existing pages. You will not be even able to check the self-test answers because they are nowhere to be found at the URL provided in the book. NADEX-centrist. Trading Binary Options was written like if NADEX was the only way to trade binary options (BO). Little is said about touch options or other types (even down-bets are absent). The book basically teaches NADEX trading instead of BO trading. The author’s understanding of probabilities is somewhat flawed. Considering dependence between different trades’ outcomes just because they are executed by an emotions-prone trader is not a correct way to teach trading. Abe looks like a total fan of Fibonacci lines and is preaching them without providing any research references. The lack of correct references at some crucial points is a big problem in some other chapters too. That is quite strange because there is plenty of references in other places of the book. Cofnas is following Alexander Elder’s stupid habit of measuring the angles of the trends in charts. I am afraid that is some kind of mind disease among the Forex authors. Additionally, Abe is recommending scaling in and out of the positions without mentioning the important disadvantages of such techniques. The book is so outdated in terms of anything related to Swiss franc. This is not the author’s fault but anyway. Considering everything written above, I would say that there are only two sane reasons to buy this book. First, if you are a complete newbie in BO (but not trading in general) and really have to start somewhere while not wanting to search for anything better. Second, if you are a fan of Abe Cofnas. Dixi.